See our brochure "LE CINQUE AQUILE"
The extra virgin olive oil “Le cinque aquile” is produced in the “Chianti” district, in Montespertoli (Florence), a little town well known in Italy for the production of wine (www.casadimonte.it) and oil. Colline di Firenze harvest 2012 with the “Gold Medal” certification. Thanks to the environmental and microclimatic conditions of our land, the mild climate and the calcareous consistency of the ground, and the methods of production, our product boasts organoleptics quality of front rank and an acidity percentage of less than 0, 2%. 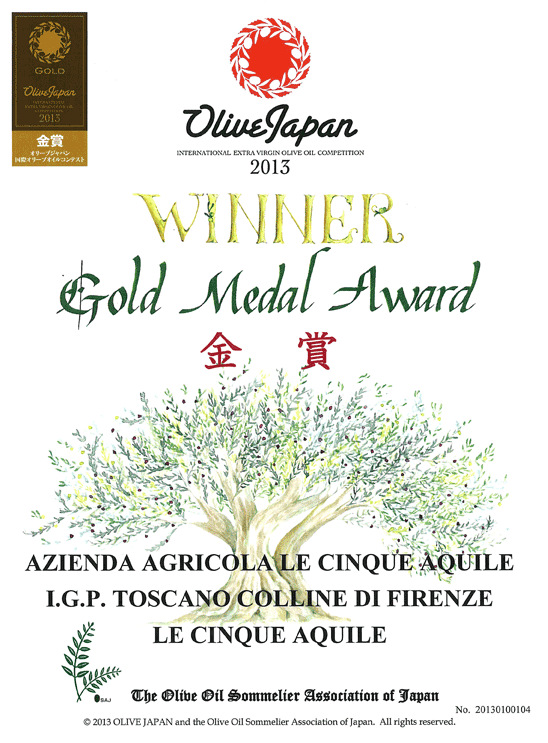 Only the best tuscan extra virgin olive oil can guarantee this genuineness and these nutritional values. The traditional color, which changes from green to gold-yellow, and a slightly bitter taste of our Extra virgin olive oil represent the typical character of the best Tuscan olive oil. The kind of olive trees that we use principally are Leccino, Moraiolo and Frantoio; to maintain the characteristic intense green of the oil just crushed/pressed we use also a little percentage of Trantolo. The harvest is realized during november, using traditional machineries and techniques that guarantee the perfect wholeness of the tree. The picked olives are taken within 24hours to the oil mill, cleaned from the leaves, washed and pressed at low temperature/heath, between 20 and 23°, to keep unchanged all the fruit’s qualities. Our oil is available in elegant bottles (0,25 / 0,50 / 0,75 lt.), tin, bag in box and personalized metal tanks from 5lt. The 0,25lt bottle can be sent on request as sampling.